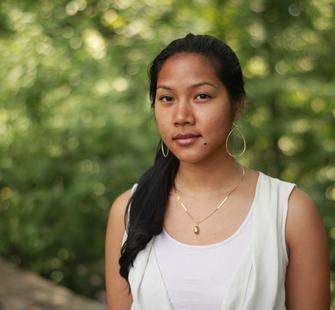 Monica Sok is a Cambodian American poet from Lancaster, Pennsylvania. Her chapbook Year Zero was selected by Marilyn Chin for a Poetry Society of America 30 and Below Chapbook Fellowship. She has received fellowships from the National Endowment for the Arts, Kundiman, the Elizabeth George Foundation, the Jerome Foundation, Hedgebrook, MacDowell Colony, the Saltonstall Foundation, the Barbara Deming Memorial Fund, Inc., and Calabash/ The Conversation Literary Festival. Her poems appear or are forthcoming in Kenyon Review, Narrative, POETRY, New Republic, Virginia Quarterly Review, and TriQuarterly Review, among others. She holds an MFA in Creative Writing from NYU. Monica is a Literary Fellow at the Lucas Artists Program at Montalvo Arts Center. Driven primarily by myth-making, Sok’s work narrates her family’s survival during the Khmer Rouge regime and explores intergenerational trauma.